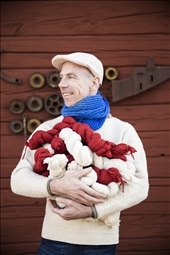 Ivar Asplund is a well-known person in the world of knitting. He is a teacher and course leader of knitting and also works in a yarn store. Ivar started to knit when he was five years old and created his first own sweater when he was around ten, without using a pattern. Since then he has designed many beautiful and well-thought-out designs.